It seems like the hilarious action film ‘Olympus Has Fallen‘, not to be confused with ‘White House Down‘, is getting a sequel. 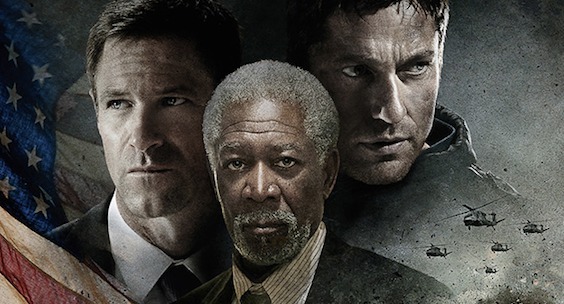 And actors Gerard Butler, Aaron Eckhart, and Morgan Freeman have all signed on for the sequel, which is called ‘London Has Fallen‘. Angela Basset and Radha Mitchell will also reprise their roles. In this sequel, the President of the United States (Eckhart) and his bodyguard (Butler), with the help of an English MI6 agent are the only ones who can stop a plot to destroy London during the Prime Minister’s funeral. Katrin Bendikt and Creighton Rothenberger are writing the script, which they wrote the first one too. Filming is set to start in London net May. If this is the course for this film franchise, I will be waiting for the sci-fi sequel ‘Earth has Fallen’. Or possibly the direct to video sequel, ‘Sheboygan Has Fallen’. Your thoughts? This entry was posted on Wednesday, October 30th, 2013 at 10:06 am	and is filed under Film, News. You can follow any responses to this entry through the RSS 2.0 feed. You can skip to the end and leave a response. Pinging is currently not allowed.